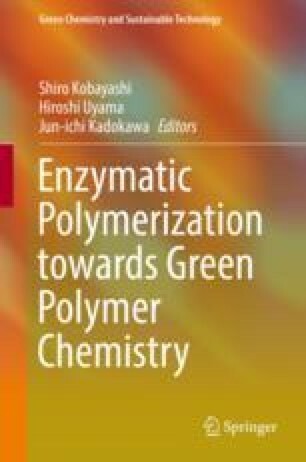 Enzymatic methods for the polymerisation of vinyl monomers are presented and critically discussed. Vinyl monomers can be polymerised initiated by enzyme-catalysed radical formation. The most widely used initiators for this purpose are β-diketo compounds, which can be transformed into the corresponding radicals via peroxidase- or laccase-catalysed oxidation. For this, peroxidases use hydrogen peroxide as oxidant, while laccases rely on molecular oxygen. Both enzyme classes comprise specific advantages and disadvantages that are discussed in this chapter. Also, parameters to control the polymer properties are introduced and discussed.